Well, we've come to the end of our Robin Hood retrospective. Ten films, including two previously reviewed Robin Hood films before the latest version came earlier this year. Now it is time to take another look, though perhaps not a final one, at this story of the outlaw who 'robbed from the rich to give to the poor'. This is a very expansive topic, and perhaps in the future I may revisit it for a more in-depth analysis; for now, let's stick to looking at just my rankings. This section covers the primary characters. In Part 2, I will look at the Merry Men, some of whom do not appear in some Robin Hood films. They are ranked in order from best to worst, with brief thoughts following. To help sort out who goes where, I've added the year next to the name. 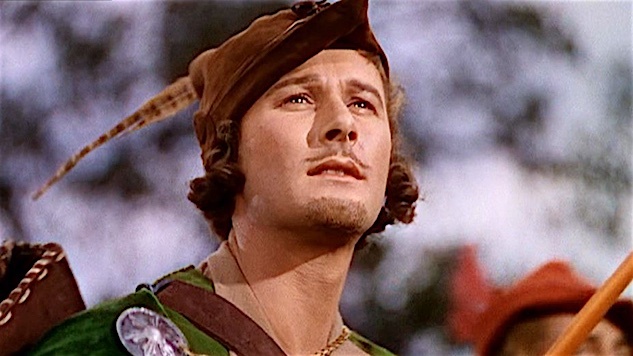 It's been eighty years since The Adventures of Robin Hood premiered, and yet no one has ever been able to dislodge Errol Flynn as the definitive Robin Hood. He really put the 'merry' in the Merry Men, and there's a reason the spoof was called Men in Tights. Flynn's lusty portrayal of the Saxon nobleman turned outlaw is still what we think of when we think of Robin Hood: the outfit, the swagger, the laughter and charm. No matter how one goes about it, either in embracing the image as the animated version or spoof did, or trying to get away from it as the two most recent versions have, there simply is no getting around Flynn's version. For good or bad, everyone else save Flynn was out-acted by an animated fox. Bedford's version has Flynn's swagger and devil-may-care manner and more importantly, his charm. He edges out Fairbanks, who today may come across as rather outlandish. However, Douglas edges out Connery only in that Fairbanks was the original to whom Flynn's portrayal owes a great debt to. I also give Fairbanks points for being almost 40 and still being so wildly athletic. Connery's Robin still has that bit of a rascal to him, but he is an older, more mature Robin, one tinged with regret. Elwes' quip about "unlike other Robin Hoods, I can speak with an English accent" was clearly a dig at Costner, but six out of the ten actors who have played Robin have been British (I figure Egerton would argue he's Welsh and Connery would say Scottish, but why quibble). Two have been Australian (Flynn and Crowe) and two American (Fairbanks and Costner). Fairbanks, however, was in a silent film, so there was no accent to speak of. Elwes ranks higher because he balanced the derring-do with the spoof, showing he could easily play a straight Robin. Costner, accent aside, at least was of a better age than Todd, who despite being 33 looked younger. Also, who really remembers Richard Todd as Robin Hood versus Kevin Costner (accent aside)? Todd at least was better than the growly, morose and crabby Crowe doing Gladiator: Medieval Times. He was nearing 50, a pretty odd age to start a franchise of seeing him leaping about Sherwood Forest. Once again age plays an issue as we go down the list, as Crowe at least looked like an adult worn down by war versus the youthful Egerton, who made Robin look like a cosplayer. Isn't it interesting that while Flynn and Egerton were the same age when they played Robin, one looked like an adult and one didn't? Finally, Ingham was my worst because he just gave a bad performance. It is extraordinary that as of this writing, Dame Olivia de Havilland is still with us at age 102. She really is 'the last movie star', or at least one of the last figures from that so-called "Golden Age of Cinema" still with us. It was a really tough race to decide between de Havilland and Hepburn, but in the end, I gave the thinnest of edges to de Havilland due to the character's evolution. In The Adventures of Robin Hood, we see her transformation from haughty Norman royal ward to an English rose, one who sees beyond prejudice to help Robin. 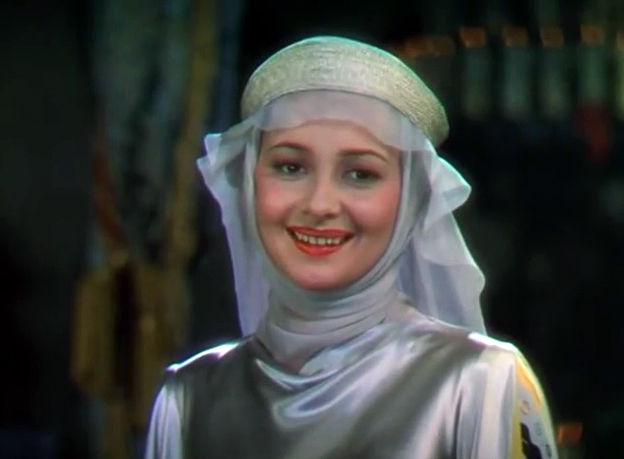 The passion Marian develops for Robin is in her performance, and you marvel at how youthful and beautiful both Marian and de Havilland are. Hepburn maintained her great beauty even as she advanced in age, and in Robin and Marian we see a woman filled with love for Robin but who has moved on. As the Mother Abbess she is strong, even independent, but the sight of Robin sparks within her those old feelings of tenderness. Her final speech to a dying Robin are so beautifully rendered. Mastrantonio deserves credit for developing, or at least pushing, the idea of Maid Marian in a better direction. Less 'damsel-in-distress' and more 'warrior princess', her Marian at least initially started out capable of holding her own. No cinematic version yet has given Marian a stronger persona, but Mastrantonio at least was a step in the right direction. Yasbeck knew that Men in Tights was a spoof but she didn't make Marian into an idiot. In certain ways, she was much smarter than the himbo Robin. I'm giving Rice a slight edge in that unlike other Marians, she at least did something. Evans was pretty as our vixen, but she disappeared for a lot of Robin Hood to where I forgot she was there. Bennett was a bit too fluttery as Marian. Dear me but Blanchett was horrendous as Marian, with no enthusiasm and almost a contempt for the whole thing. She at least had some sense, which is more than I can saw for Hewson, who was nothing. Even Hewson's blank performance was better than Hamilton, who was there in body but not in anything else. While the Sheriff of Nottingham has appeared in every Robin Hood story, he is not always the villain curiously enough. We'll look at the antagonists a little later, but for now we're staying with our wicked Sheriff. There is really only one performer who has made the Sheriff into an iconic role, and that is the late-and-much-missed Rickman as our bonkers Sheriff. His performance is in turns malevolent and almost mirthful, a figure who knows he's evil and makes no apologies for it. He pushes camp without going full-on overboard, someone who is clearly a menace but who is almost childlike in his manner. Whether it's his command to 'cancel Christmas' or his lusting after the Maid Marian, Rickman commands the screen so much he blows everyone away. The film may be Robin Hood: Prince of Thieves, but it's the Sheriff who leaves a major impression to where he might as well be the star of the film. Cooper is unique among Sheriffs in that he is clearly comic relief, as far away from Rickman's version as one can get. Actually, he's as far away from any version of the Sheriff. He is clearly an idiot, blustering fool who is of no menace to anyone. However, that's the performance that it was meant to be. Again, unlike other Robin Hood films, his Sheriff was not the antagonist, otherwise it would have been a short film. Cooper manages to be comical without it seeming totally idiotic to think he'd be the Sheriff. It's a great balance and a credit to him as an actor. Shaw's Sheriff was more calculating, more methodical. He was not the raging, bonkers Rickman or the blustery Cooper. Instead, he was more than willing to bide his time until Robin came to him. He is a confident antagonist, which makes him a more menacing one. Buttram was just nasty, fitting for a wolf, and his unique voice got some of the humor without losing the meanness of his Sheriff. We forget Finch was in a Robin Hood film, which is why he ranks somewhere in the middle. He was not bad, but his performance was not in the same level as his later career would be. I don't really remember Lowery, but he ranks higher because Rees' spoof was not as funny as it could have been. Arnatt was more unintentionally comical, but at least he had a role in A Challenge for Robin Hood. That's again more than I can say for Macfayden, who was not so much inept as he was unnecessary. He was just there to start up for the hoped-for franchise that did not come. Poor Mendelsohn, like Macfayden, is doomed to be in a film that was meant as a franchise but that will get no sequel. Unlike Macfayden, however, Mendelsohn was in the thick of it, and his performance was just sad: bonkers but pointless. Again, there have been films where Robin's main antagonist is not the Sheriff of Nottingham. Our bad Sheriff has been Robin's primary antagonist, but not his exclusive one. In all the Robin Hood films, we see one antagonist who really commands our respect and even fear. That is Basil Rathbone as the evil Sir Guy of Gisbourne, a character who has appeared in four versions (1922, 1938, 1991 and 2018). Rathbone's Sir Guy is the most dangerous of villains: a smart one. He is unrepentant, unafraid and almost Robin's equal. He is the Moriarty to Robin's Sherlock Holmes, the Master to Robin's The Doctor. His wickedness, his bigotry, his contempt for his hated rival is matched by his skills as a fencer and plotter. He is not to be trifled with, which makes Robin's gleeful trifling all the more grating. Rickman comes close to matching Rathbone in spirit, his Sheriff clearly malevolent but unlike Rathbone, slightly more aware of the grandness of his malevolence. Shaw has Rathbone's plotting nature but not his rage or antagonism. Buttram's Sheriff is slightly more comical but again with a nasty side. Again, I cannot recall much of Sam De Grasse's Prince John, but he was not afraid to hang people to get his way. I give Rees the slight edge over the others in that at least it was meant to be funny. The others just ended up funny. Mark Strong's Sir Godfrey was so unimaginative and I don't remember him at all. I remember Blythe's Sir Roger as being camp with a capital C.
As for Mendelsohn, all he did was act as if this were an elaborate dress rehearsal for the next Star Wars film. Really, he ought to try doing a comedy. As if there were any other choice? The Adventures of Robin Hood is one of the greatest films ever made. It has action, romance, comedy, a thrilling score, a fast-pace, engaging story and simply perfect performances all around. Every film save the original silent version is in its shadow. It has been spoofed, it has been name-checked in other films (such as The Rocketeer, where an Errol Flynn-type actor was doing a Robin Hood-type movie). It also is the standard to which all other Robin Hood films are measured against. Even at 80 years, it is still seen and loved. The silent Robin Hood ranks slightly higher only because in many ways, the Flynn version emulates it: the athleticism, the romance, the danger, the cockiness all come consciously or not from the silent film version. Even as it closes in on the century mark, it still holds up rather well. Robin and Marion is a beautiful meditation on aging, on regret and love rediscovered. It's a deeper and more moving film that really should be rediscovered. It also has a beautiful John Barry score, which while not as good as Erich Wolfgang Korngold's is still quite a fantastic piece of music. The animated Robin Hood is by no means perfect. You can see where Disney cut corners, but it has its own charm and is a nice way to introduce children to the story. As much as Robin Hood: Prince of Thieves is bashed, and with cause, I found myself entertained enough to like it. It also helps that it has Alan Rickman's bravura performance and the introduction of the 'noble Muslim', something that almost all succeeding Robin Hoods have included. The Story of Robin Hood and His Merrie Men is pleasant enough, though not something I would rush to see again. It's also probably the last good Robin Hood film seen in this retrospective. Robin Hood: Men in Tights has only the songs and Cary Elwes & Amy Yasbeck's performance to really recommend it. The jokes were obvious and not funny, and it's only to Elwes and Yasbeck's credit that they managed to make it watchable. The two failed franchise-starters in 2010 and 2018 were awful. The only difference is that 2018 did not take itself as seriously as 2010, not that that's a recommendation. Robin Hood 2018 thinks it's smart. Robin Hood 2010 thinks it's important. Both are dead-wrong. As for A Challenge for Robin Hood, the challenge as I wrote is to stay awake. Apart from James Hayter's performance as Friar Tuck, the movie is a bore. Well, there it is, but there is more. I'll look at the Merry Men in the future. I may also give a deeper look at the various films. For now, however, I think we've reached the end of our romp through Sherwood Forest.